The September movie schedule has demonstrated all of the appeal to consumers as season tickets for the Kansas City Royals. Don't think I'm exaggerating for effect, either. There have been seven titles released since Labor Day, the traditional end of the summer box office season. The average opening weekend of this group is $7.8 million. Even worse, five of those seven films failed to reach even the $10 million mark and another, The Black Dahlia, did so by a suspicious less than $6,000. Gridiron Gang is the "winner" thus far with a $14.4 million debut, but even it is widely considered disappointing given the subject matter and the film's lead actor's track record. Let us not sugarcoat this. We are in a box office rut. So, how does Hollywood plan to get themselves out of this mess? The same way they always do! They plan to appeal to the lowest common denominator with a production that does so proudly, perhaps even stubbornly. Enter Jackass: Number Two, now with more scatological humor than ever before! Johnny Knoxville, Steve-O and Bam Margera's first outing, Jackass: The Movie, was a shocking performer upon its release in October of 2002. The $5 million production opened to an amazing $22.7 million on the way to total domestic receipts of $64.3 million. Even the most unscrupulous Hollywood bean counters had difficulty hiding the profits with that baby. A sequel was a no-brainer (no, that's not a cheap shot at Steve-O), but the difficulty was in finding enough new stunts to satiate their die-hard fans while accommodating the schedule of suddenly white-hot Knoxville. The artist formerly known as Phillip John Clapp saw his schedule fill up with what seemed like frontline projects, at least on paper. Alas, Men in Black II, Walking Tall, Lords of Dogtown and The Dukes of Hazzard all wound up being either critical or financial disappointments. After the critically reviled Hazzard adaptation, Knoxville looked at the choices available to him and decided that returning to his roots was the way to go. In January of this year, he threw his body back on the line for the entertainment of frat boys and high school kids across the country. His decision appears to be a smart one, as Jackass: Number Two finds absolutely nothing in the way of box office competition from returning releases. Its opening weekend of $25.6 million will indicate more than the previous two weekends' biggest pair of openers combined. And let this be a lesson to you kids out there: The real money is getting your tooth pulled out on camera. That college education crap is wildly overrated. The real money is in guerilla video. 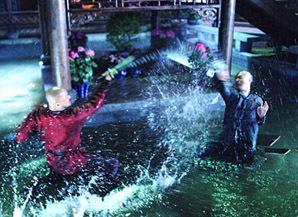 Jet Li, the reigning king of martial arts movies, is abdicating his throne after the release of this, his latest action epic, Jet Li's Fearless. His stated opinion is that he wants to quit while he's on top and he cannot imagine a better time to stop than after a quality project such as Fearless. Critics seem to agree with the opinion as the movie has been very well received thus far (74% positive at Rotten Tomatoes as I type this). The movie tells the story Huo Yuanjia, the founder of the Chin Woo Athletic Association. Unless that's the official title for what Jean-Claude Van Damme was doing in Bloodsport, I have no idea what that group is, but the action scenes in Fearless are (allegedly) Li's best ever. If you are anything like me, that's plenty good enough reason to go see it. An Unleashed-like $10.2 million seems to be in the cards for what BOP guarantees will not be Li's final movie in the genre, no matter what he or his agent says.